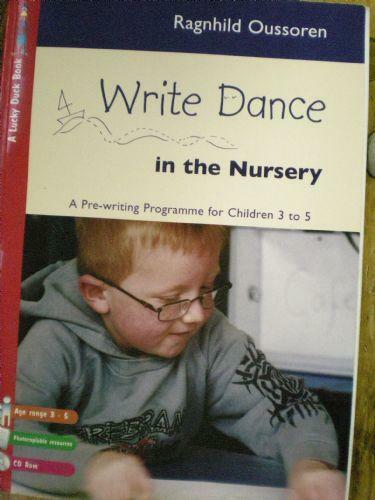 Write Dance is a handwriting methodology and handwriting method designed for all children in primary education. Write Dance tries to teach children to write starting from their own emotions and natural movements, giving it their own 'swing'. Write Dance offers opportunities for movements to come naturally and all the actions are concentrated on making the children feel happy and comfortable with their bodies. There is an introductory themed story and lyrics of a song and suggestions for movements and writing which is demonstrated by the adult, then the children move their bodies to the music, listening to the lyrics and it is amazing how well the children remember the movements and what comes next in the song! Then we repeat the song and use streamers, scarves and ribbons to extend their movements and encourage them to look at the shapes they make. The next session we use crayons, chalks etc to 'scrimble' as much as possible with both hands on large pieces of paper whilst listening to the music. Scrimble means to work on a writing surface by scribbling, doodling, circling, experiencing and experimenting. Hands up - how high is the sandcastle!